Your stay on Cape Cod will be filled with fun, beauty and adventure. We've put together this list of fantastic things to see and do here to help you make the most of your Cape Cod experience. Before this lighthouse was moved from Chatham, three towers, the Three Sisters, served the area. They are on display a hundred yards from the present light. Follow Rt 6 to Eastham. 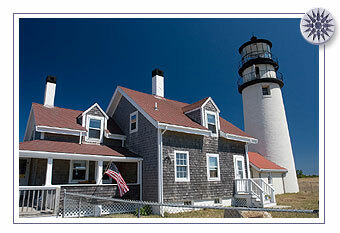 Take Nauset Rd, next to the Salt Pond Visitor Center, then Ocean View Dr. to Nauset Light Beach. In 1797 George Washington ordered the construction of the Cape's first lighthouse to warn sailors of the area known as the "Graveyard of Ships." The current beacon, with over 620,000 candlepower, is the most powerful light in New England; ships from 30 miles away can identify this landmark. In July 1996, the lighthouse, then only 100'away from an ever-eroding cliff, was moved west 450-feet to its current location. Take Route 6 to Truro. Follow signs to Highland Light off Highland Rd. For centuries before our canal was built, this 40' beacon (1816) helped guide ships around the tricky shoals. From Herring Cove Beach, the light is about a mile hike north across the sands. Wood End light, built in 1872, is an exact replica of Long Point Light, erected in 1822. You can see the latter from MacMillan Wharf and the former at the end of Commercial St. Wood End is about a half mile walk across the breakwater. Long Point Light is an hour's trek beyond. Route 6A & Shore Road 508-487-6200. Cape Cod's Premier Vineyard. High Pole Road. 508-487-1310. 252 foot monument, the tallest granite monument in the US. Commemmorates the Pilgrims 1620 landing. President Theodore Roosevelt laid the cornerstone in 1907. 116 stairs, 60 ramps. Modeled after the Torre del Mangia in Siena, Italy. On a good day can see 30 miles to Boston. Museum features salvage from the Pirate ship Whydah, which sank off Marconi Beach in 1717. Treasure recovered in 1985. Tributes to Pilgrims, whaling captains, shipwrecks, etc. Route 6, at the Eastham Wellfleet town line. 508-349-7176. No need to drive to Provincetown & find parking, The Big Fisherman is located on the route to downtown Provincetown & beaches. Flex, local bus to Provincetown, Just flag the bus out in front of the Captains Locker and they will drop you in the center of Provincetown.